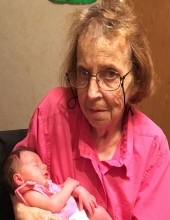 Charlotte G. Shanks age 68 of Hunt City passed away Wednesday, October 10, 2018 at Terre Haute Regional Hospital, Terre Haute, Indiana. Funeral services for Charlotte will be held at 1:00 p.m., Tuesday, October 16, 2018 at the Crain Funeral Home, Newton with Brother Al Malo officiating. Visitation will be from 5:00 p.m. until 8:00 p.m., Monday, October 15 at the funeral home. Burial will be in the Brockville Cemetery, rural Jasper County, Illinois. In lieu of flowers, memorial gifts may be made to the family. Charlotte was born on May 14, 1950 in Providence, Kentucky the daughter of Arvel Pruitt and Polly Garner. On August 27, 1966, Charlotte married Roger Dean Shanks. He survives. Charlotte worked at the Newton Broom Factory for twenty-nine years. She was a member of the Salem Missionary Baptist Church Oblong, Illinois. Charlotte was a loving wife, mother and grandmother. Her kind hearted nature led her to being a wonderful caregiver to those around her. Charlotte will be loved and remembered by her husband Roger Dean Shanks of Hunt City; mother Polly Shelby of Tucson, AZ; son Dale Shanks of Willow Hill; daughter Debbie (Eric) Jackson of West Union; grandchildren Katy McKinley-Shanks, Lily Shanks, Ambr Shanks, Josy Shanks, Erica Owen and Noble Jackson; great-grandchildren Levi Stoner and Justice Owen; siblings Neda (Jeff) Wright of Portage, IN, Richard (Terri) Pruitt of Valparaiso, IN, Dora (Bill) Shumaker of Portage, IN, Kenny (Michelle) Pruitt of Tucson, AZ, Scott (Brenda) Pruitt of Kentucky, Jerry Pruitt of Kentucky and Dewey (Tanya) Pruitt of Kentucky; brother-in-law Herschel (Phyllis) Garner of Valparaiso, IN and brother-in-law Terry (Donna) Shanks of Indiana; many nieces and nephews and dear friend Rowena Swisher of Willow Hill. Her father, Arvel Pruitt, preceded her in death. To plant a tree in memory of Charlotte G. Shanks, please visit our Tribute Store. "Email Address" would like to share the life celebration of Charlotte G. Shanks. Click on the "link" to go to share a favorite memory or leave a condolence message for the family.